The beginnings of life, survival, and the great American spirit. A friendly competition sprung up, and on July 4, 1883, Pecos became home to the World’s First Rodeo. Braggin’ rights were on the line to find out just who was the best cowhand in the West. 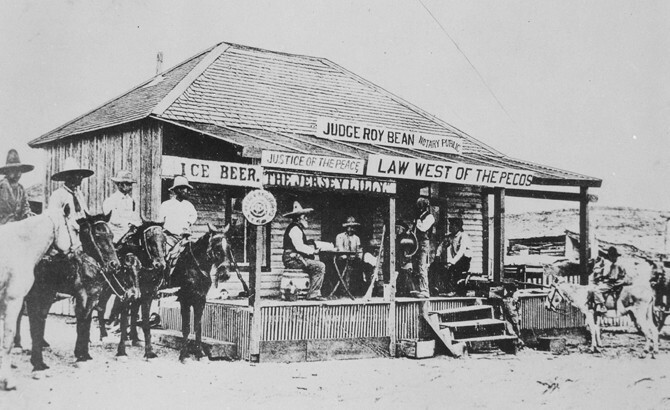 “The Jersey Lily” courthouse/saloon is where Judge Bean, known as “the Law West of the Pecos,” carried out his justice. Bean was looked upon as an unusual judge from the beginning. His judicial acts were somewhat odd and always final. The Pecos Municipal Airport currently operates on what was the PAAF, a pilot school that averaged 360 flying days per year—more than any other location in the country. Today the airport houses a permanent PAAF memorial, open to visitors. In 1881, this railway connected Ft. Worth and El Paso, helping the area prosper and bringing fame to the sweet Pecos Cantaloupe. Today it houses the Pecos Area Chamber of Commerce, Visitor Center, and “Rodeo Hall of Fame” collection. 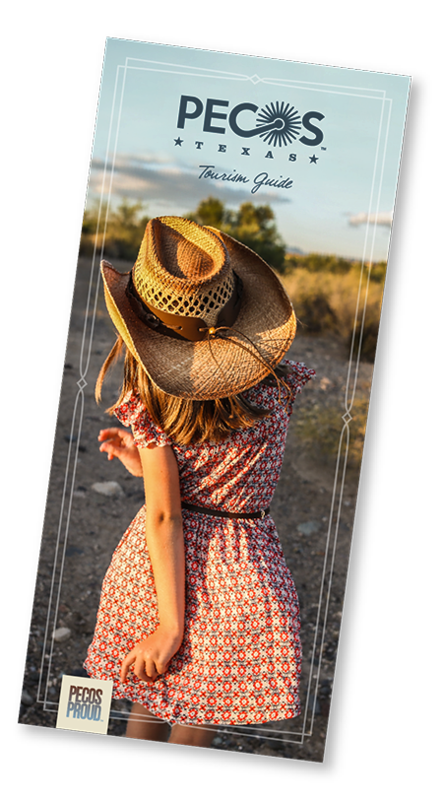 Alongside the West of the Pecos Museum you’ll find Centennial Park, offering a shady respite, plenty of benches, a fountain, and a first-rate view of Pecos history. Think back to the Old West’s cowboys and ranchers, and it's difficult to conjure a more iconic image than the chuckwagon. Come get a close up look at the Scarbrough/Linebery family’s chuckwagon, an authentic piece of Western lore. Trace the history of the automobile as you stroll through this museum of well-preserved exhibits. Everyone will find something of interest and enjoy a nostalgic trip down memory lane. Recorded as the oldest house in Pecos, Mesquite House was built by Peter Goodloe and was originally located at Second and Willow Streets in Pecos. In 1975 the house was moved to its present location in Centennial Park. Built from nearby-quarried sandstone, the famous three-story Orient Hotel/No. 11 Saloon was touted the “best hotel between Ft. Worth and El Paso.” In classic Old West fashion, a man was shot in the saloon, and the bullet holes remain to this day! Pecos’ first Catholic chapel was donated by local families in 1889 and gained a missionary priest in 1890. Thirty-four years later, the Catholic faith made a permanent home in the stony Santa Rosa de Lima Church, named for the Peruvian Saint Rose. Fifty miles northeast of Pecos is Wink, TX, home of Roy Orbison. The tiny town (pop. 940) is in “the middle of nowhere, 500 miles from everywhere,” as Wink’s most beloved son once said. Come see photos, posters, guitar picks, and other memorabilia. 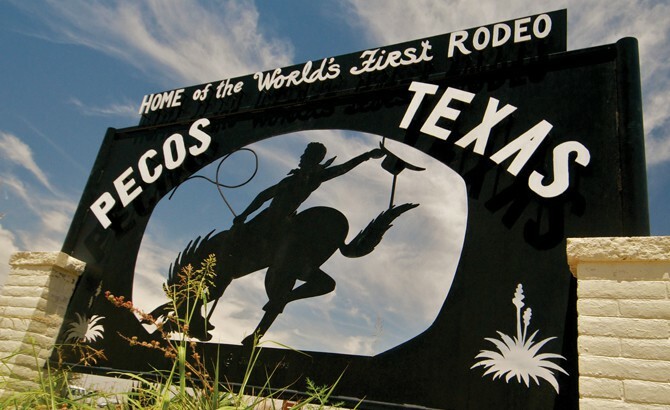 On July 4, 1883, Pecos was home to the World’s First Rodeo.